Paint ‘n sip, paint and wine—however you call it, it’s the latest trend blazing a trail through South Carolina. If you ever felt the artistic itch after watching a 30-minute Bob Ross tutorial, here’s your chance! For those who aren’t already in the know, paint and wine now exist in beautiful harmony. With a glass of vino at arm’s reach, an inspired artist guides small groups step-by-step to help you turn a blank canvas into a wall-worthy take-home trophy. Here are the top 10 spots in South Carolina where you can sip some wine while you channel your inner artist! The folks at Uptown Art provide everything you need—including carefully-guided instruction—to create your own spin of a unique work of art. But the experience is just as important as the final product. here you can expect an atmosphere that not only gets the creative juices flowing, but also enjoy time with friends new and old. Grab some snacks, drinks, and friends, and head to Paint-Play Studio for an evening of relaxing social painting. Catch a preview of their art calendar on their website, or sign up for one of their more intense specialty classes. 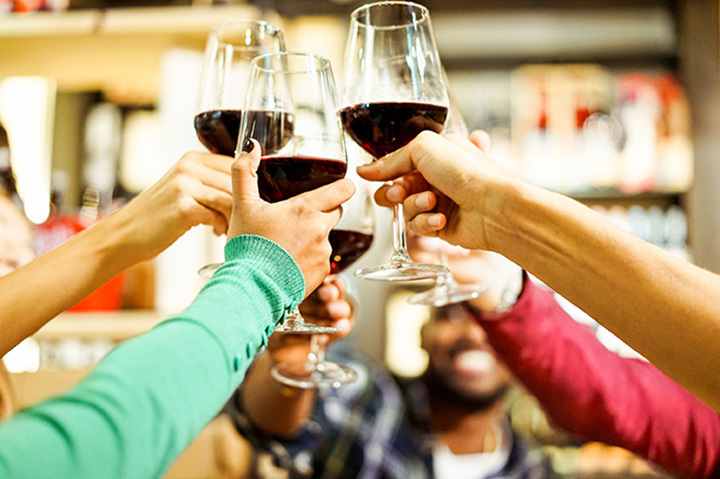 Wine and Design is putting new spin on parties, events, team building, and nights out with friends. With professionally-trained artists guiding the way, you can create a masterpiece from scratch while you sip and munch on studio-provided refreshments. By the way, there are several Wine and Design locations dotting the state of South Carolina, so if you can’t make it to Greenville, you won’t have to lead a life devoid of art. Get ready to “Pour Your Art Out” Studio Cellar offers painting classes, freestyle paint, and painting parties for all types of creative skill levels. Schedule a spot in one of their step-by-step classes. Or, if you want to take off your painting training wheels, you can head to the Art Bar anytime and see what transpires. Could there be a more dynamic duo than a glass of vino and the artistic stylings of some of the greats, like Van Gogh? Probably not. Adults can enjoy kid-free classes while they studiously create a museum-worthy masterpiece. They also offer kids-only classes and parties to spur the creativity of burgeoning artists. If the beautiful sunrises over the Beaufort waterfront aren’t enough inspiration, head to Wine Your Art. Here, instructors can infuse your creative soul with a vino elixir and guide you on a paint-filled journey to create a work of art worthy of a spot on your walls. After a quick visit to the wine aisle at the grocery store, head to The Cabernet Canvas and enjoy your wine purchase during a group instruction painting session. Their goal here to provide everyone with an interest in art the ability to unleash hidden talents and creativity. They’re also heavily involved in the local community and work hard to give back in beautiful ways. If you ever thought painting beautifully would never be more than a dream, you owe it to yourself to try Painting with a Twist. They make it super simple to follow well-crafted instructions to turn your paint strokes into something not only recognizable, but also something you can be proud of. Scared of trying something new? Afraid your friends will criticize your efforts? Fear no easel! With step-by-step guidance from talented instructors, you can create a single masterpiece, or work with a friend to create a dual canvas tandem painting. When you’re finished, your family and friends might ask if you really painted it yourself, but in a good way. Spend two hours at the movies, and you get to take home a ticket stub. Or, spend two hours at Lexington Paint & Pour, and you leave with a brand new one-of-a-kind original piece of art, new friends, and memories that will far outlast any ticket stub. It’s BYO for drinks and snacks, so you can fuel up on exactly what you need to send your creativity into overdrive.